Brian Johnson, from Kelleher & Sadowsky, recently represented Stoneville Realty, LLC in the leasing of 319A Southbridge Street in Auburn, MA. The ±1,150 square foot suite will be occupied by the Detox Shop and Spa, Inc. About the Detox Shop and Spa, Inc. Owners, Michele and Ken Miller will offer a unique spa experience to all who are looking for ways to cleanse their bodies and mind from a world full of toxins. Some of the services they will provide: Far, Near and Infrared Sauna with Acoustic Resonance Therapy Sweating is one of the body’s most natural ways to eliminate toxins, making it a crucial part of detoxification. This sauna also offers sessions with acoustic resonance therapy. When we feel music resonating through our bodies, it naturally brings deeper body awareness. X’Tract Lymphatic Massage X’Tract is a transforming detoxification modality that delivers wellness through the lymphatic system on a cellular level utilizing essential oils in the delivery system. The lymphatic system is the body’s garbage disposal and holding tank for toxins and fat. If not released out of the body, the entire system can become lax and sluggish, which may result in sickness and disease. Raindrop Massage This is a combination of several holistic techniques to create a synergistic effect for your body, Aromatherapy, Vitaflex and Featherstroking. It is designed to bring the body back into structural and electrical alignment. Often, many spinal issues and misalignment are caused by or exacerbated by toxins (such as viruses) that lie dormant within the spinal column. The use of essential oils helps to dispose of these toxins and viruses within the spine, causing structure to return to normal. This technique can ease muscle, bone and joint discomfort while aiding the body’s natural response to irritation and injury. Aroma Freedom Technique The Aroma Freedom Technique Certified Practitioner will equip you to help yourself and others find greater success, joy, and happiness. This is a proven system created by Dr. Benjamin Perkus that uses Essential Oils to release negative thoughts, feelings, and memories. The Aroma Freedom Technique integrates specific Essential Oils with proven psychological principles. AFT is simple and and powerful! HydroMassage We can give our clients a unique form of water massage therapy with HydroMassage Lounges. HydroMassage is an unattended water massage bed, therefore ideal for clients who don’t want to disrobe or be touched by a massage therapist. Additionally, clients don’t have to set apart a large part of their day to enjoy HydroMassage, they can enjoy it on their lunch break, before or after work, and still enjoy the benefits that one would receive from a traditional massage. BioCharger™ NG The BioCharger™ NG is a hybrid subtle energy revitalization platform. The transmitted energy stimulates and invigorates the entire body to optimize and improve potential health, wellness, and athletic performance. The BioCharger™ NG is completely non-invasive, and has proven to restore strength, stamina, coordination and mental clarity. 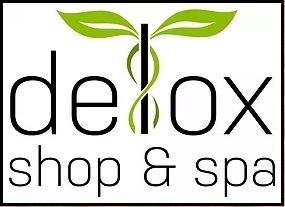 A Selection of Retail Products The Detox Shop and Spa plan to create a small retail section offering products such as alkaline waters, supplements, essential oils and various non-toxic items that are all targeted towards general detox and wellness. Contact [email protected] or at 508-832-3850. Book online appointments at www.DetoxShopandSpa.com.